Christopher Hill is in his 32nd season as principal clarinetist of the South Dakota Symphony Orchestra. 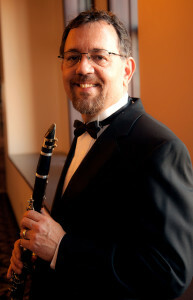 Paul Globus, in The Clarinet magazine, calls Hill a “first rate clarinetist… whose playing is uniformly excellent.” He has performed with the Baltimore Symphony, Philadelphia Orchestra, Omaha Symphony, New Sousa Band, Carousel National Tour, Evita World Tour, Jimmy Dorsey Orchestra, Binghamton Symphony, and the Rome Festival Orchestra. He has been a soloist with the SDSO, Sioux Falls Municipal Band, and other orchestras and bands, and he and John Walker performed at ClarinetFest 2005, in Tokyo, Japan. They have recorded a CD of this music, and he is also featured on two recordings with the SDSO. He also performed at ClarinetFest 2012 with the Manhattan Basset Horn Trio. Hill is the conductor of the Sioux Falls Municipal Band, and has conducted the SDSO, Hunterdon Symphony, and was a rehearsal conductor for the Carousel National Tour. He has been a clinician at many universities and music schools, including The Peabody Institute, University of Minnesota, Arizona State University, University of Northern Iowa, University of Southern California, and Oakland University, and is a clarinet instructor at Augustana University. Hill holds a Bachelor and Master of Music degree from Temple University, where he was a student of Anthony Gigliotti. In addition, he has studied with Donald Montanaro, Burt Hara, Ronald Rueben, Karl Herman, David Peck, and George Silfies. A noted mouthpiece craftsman, Hill is the designer of his own line of mouthpieces.